Burgle Bros. is a cooperative game for 1-­4 players. Players are unique members of a crew trying to pull off a robbery of a highly secure building - without getting caught. The building has three floors (4x4 tiles), each with its own safe to crack. Players start on the first floor and have to escape to their helicopter waiting on the roof. Burgle Bros, is a cooperative game for 1-4 players. 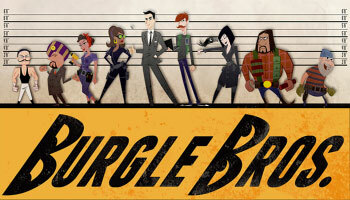 Players are members of the Burgle Bros., an elite crew that can pull off impossible heists. Your mission is to get in and out with- out getting caught. There are many types of alarms and patrolling Guards to avoid. If anyone gets caught, it's all over. Find the Safes, crack them, and get to the roof to escape! Once you are comfortable with the gameplay, you can customize wall layouts to make the game more difficult. Take 8 Wall pieces per floor. Place them between tiles (not on the outside), making sure no area is blocked off and inaccessible. Long dead ends and choke points make the floors more challenging.